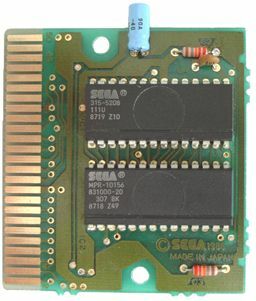 The 1 Megabit (128K) Sega Master System cartridges based on the 315-5208 mapper chip can be modified to accept a standard 128K EPROM. 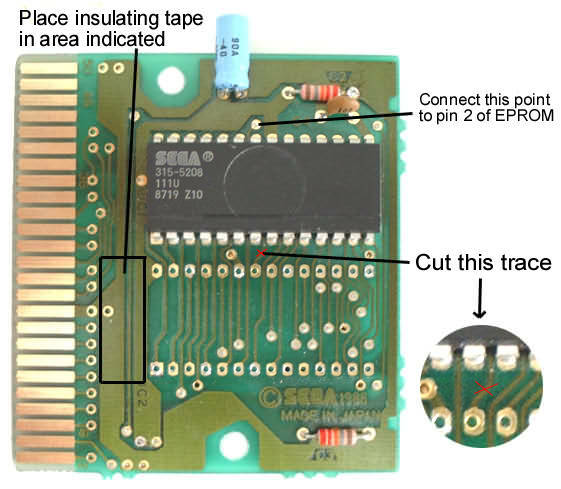 The procedure involves desoldering the original 28-pin ROM chip and replacing it with a 32-pin socket wired to correspond with the EPROM pinouts. Having identified a suitable cartridge, open it up and remove the PCB. It should look identical to the picture above. The first step is to desolder the ROM chip, which is the lower of the two chips in the picture. Use desolder braid, rather than a "solder sucker" - these are effective, but quite vicious, and often damage the delicate PCB traces. The braid I use is "3S-Wick" brand, AA gauge (1.5mm width). It's rosin impregnated and antistatic, and I've found it works very well. Place the free end of the braid on the solder joint (on the underside of the PCB). Put the soldering iron tip on top of the braid, and apply firm but gentle pressure. The solder should be "soaked up" by the braid. Remove braid and iron simultaneously. Cut off the solder-impregnated end of the braid. This particular PCB type uses plated through-holes, so you may have to turn the board over and repeat the desoldering operation on the top side of the board. When you've removed the solder from the holes, gently wiggle each chip pin with pliers to free it from the tiny residual amount of solder present. Then gently, using a flat screwdriver or IC tweezers, attempt to pull the chip from the board. Don't force it - it should come away fairly easily. If it won't budge, check for any solder that may still be holding some pins in place. 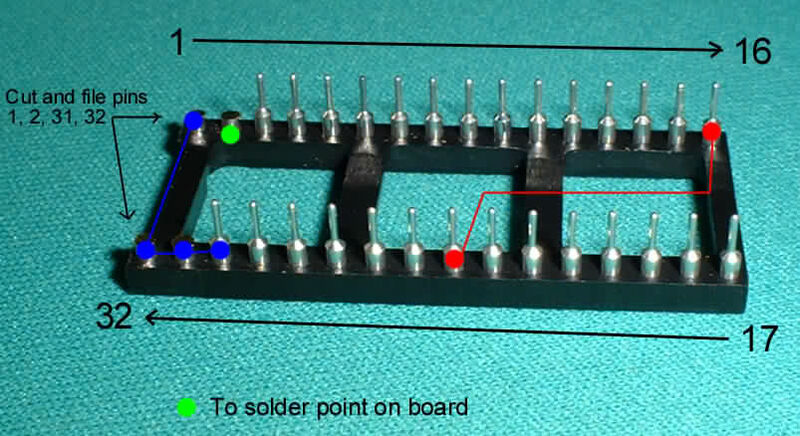 Once the chip is out of the board, use the braid to remove any remaining solder from the holes. 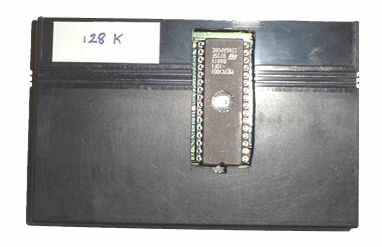 The chip is a standard 831000 type ROM, and can be read using an EPROM reader if desired. You now need to do two things - cut a trace on the board, and apply a piece of insulating tape to prevent some pins of the socket from shorting out. The picture below shows what has to be done. Use a Stanley knife or similar to cut the trace, being extra careful not to cut any neighbouring traces. Obtain a 32-pin, turned-pin DIL IC socket such as the one shown (upside down) in the picture below. Cut the legs off pins 1, 2, 31 and 32 and file them down. You now need to make some wire links - connect pin 24 to pin 16, and connect pins 1, 30, 31 and 32 together - remember to solder to the wide part of the pin only, not the leg! Solder a wire to pin 2 which is long enough to reach the solder point shown in the picture above, but don't actually connect it yet. Insert the socket into the board - pins 16 and 17 go at the top of the board, away from the edge connector. 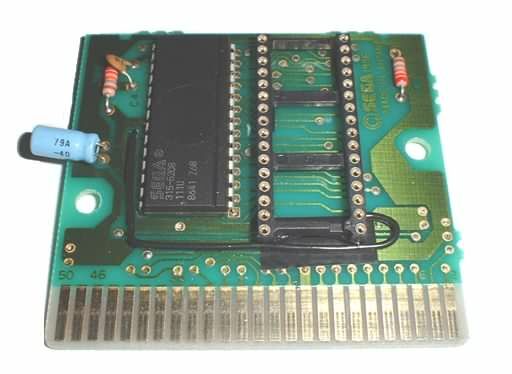 Press it fully home so none of the pins' legs are visible on the upper side of the board - this is vital if the EPROM is to have enough clearance to fit in the SMS cartridge slot. Hold the socket in place with Blu-Tack or similar while you solder all 28 of the legs on the underside of the board. Finally, connect the free wire from pin 2 to the solder point indicated. Your cartridge is now ready to use! You can either use the board "bare", or you can cut a hole in the cartridge casing to allow you to insert and remove EPROMs. When inserting an EPROM, align it so that the notch faces the edge connector. Written by Mike G, 7th August 2000.